A great magazine is commemorated with an equally top-flight anthology. In 1967, Clay Felker assembled a group of journalists and editors in his Manhattan apartment with big plans, and they made good on them from the very start, making of New York magazine not just a chronicle of the city, but also a kind of microcosmic view of everything important and interesting everywhere. 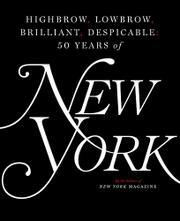 Write the current editors in their foreword, “Felker knew that a magazine grounded in the story of New York could also be a magazine about the whole world, and it is amazing how much history coursed through the city’s streets.” This oversized, overstuffed anthology makes a fine argument for just how true that is. Early on, for instance, comes Tom Wolfe’s “eyewitness report” of the birth of the “New Journalism,” for which he was largely responsible but for which New York made a welcoming vehicle. There are notes on the business and political ends of the enterprise, as well: Rupert Murdoch once owned the magazine but pretty much left it alone, while Michael Bloomberg was a constant source of fascination and copy—“the Bloombergification of New York,” wrote Justin Davidson in 2013, “isn’t complete yet, and won’t be for a generation.” There are a few greatest-hits bows, including, of course, Nik Cohn’s story “Tribal Rites of the New Saturday Night,” the basis for the epochal movie Saturday Night Fever. More than that, the editors reproduce material that speaks not just to passing moments and fashions, but also to constant editorial emphases, such as high-quality artwork and portraiture, with pages devoted to Ali MacGraw, Pam Grier, Grace Jones, and other zeitgeist-y figures. On that note, the menacing photograph of Christopher Walken, who was probably aiming to look pleasant, is alone worth the price of admission, not to mention striking photos of a host of other actors, including John Lithgow, Steve Buscemi, and Edie Falco. History, local and global, unfolds in this fine gathering that represents a half-century and more than 2,300 issues.